Last Thursday was Annette DaBomb’s final performance downtown at the Gaslamp Speakeasy, and it was bittersweet to me. I’ve come to love her and her beautiful voice. 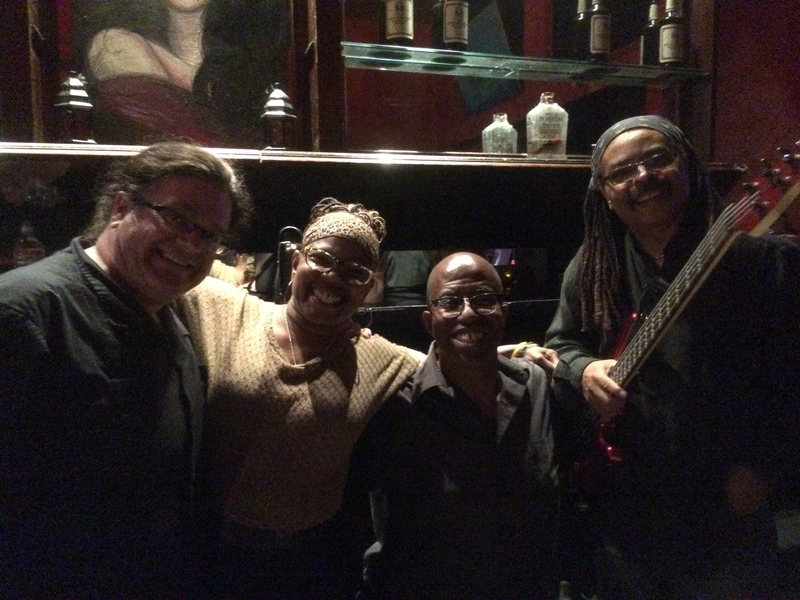 Here’s Annette with her Bomb Squad musicians, long-time drummer Tony Peterson, keyboardist Alan Zundelevich, and bass player Cecil McBee. And some video I took the week before of Annette singing that great cover song Everyday I Have the Blues. Every jam has its own familiar faces and this week we had a good mix of regular JammingOut musicians who were back to jam together and have a good time. As one of the JammingOut hosts, Rosa Lea Schiavone, recently said, “everyone leaves their ego at the door” and its so true. It’s a great group of people and a lot of fun, and the jam runs from 7-11pm every Wednesday night. In this video another one of our hosts and a guitar player, Doyle Thomas, got on stage and sang the cover song One Way Out. Playing with him are David Damaso and Mike (standing in back and not sure of his last name) on guitars, David Lewis on harmonica, Matt Casey on drums, Dino on trumpet and I didn’t catch who was playing the bass. At the end of the night and last song, we were entertained by Kevin Cooper on bass, singing Mustang Sally – who was joined by Tony Peterson who amped it up even more, along with Lafayette and Mike on guitars, Dino on trumpet, and I can’t remember who the drummer is. Lots of fun for everyone! Thursday night, I was able to catch the lovely Annette DaBomb and talented bomb Squad band members at the Gaslamp SpeakEasy. They are a total delight (and often quite playful) as they perform a soulful mix of blues, jazz and swing jazz, like the Frank Sinatra cover song The Lady is a Tramp in this first video. Accompanying Annette are Tony Peterson on drums, Alan Z (Zundelevich) on piano, and Doug Brunelle on bass, clarinet and flute. And last, but not least, that great cover song Fever, first performed by Little Willie John and later sung by Peggy Lee, Elvis Presley, Ella Fitzgerald and many others. Every Thursday night you can hear this beautiful lady’s voice at the Gaslamp SpeakEasy (from 9p-1am), singing a mix of blues and jazz. I absolutely love her voice, and I’m thrilled to finally get some good video clips from her weekly gig. Annette is joined with her Bomb Squad band members… Tony Peterson on drums, Doug Brunelle on bass (as well as the clarinet and flute), and Alan Zundelevich on keyboard. In this video, the band is performing cover song Got My Mojo Workin. For Billie Holiday fans, Annette will melt you as she sings this cover song All of Me. And in this last video, Annette and her Bomb Squad are performing Eric Clapton’s cover song Further On Up the Road. I have missed hearing Annette’s incredible voice and the way she sings the blues, mixing it in with her jazz roots when she plays with her jazz band at the Gaslamp Speakeasy every Thursday night. She is fun, personable and wonderful to listen to. I will definitely be back more often! Here she is singing that great cover song, Got My Mojo Workin’, with band members Doc Holiday on keys, Tony Peterson on drums and Doug Brunelle on bass guitar. Here’s another clip of them doing the cover song Hard to Handle. If you haven’t heard Annette’s group in person, you are missing a special evening and a real treat. They also play at Magnolia Tap & Kitchen about once a month. Check my calendar to see when they will play there next.